ROBERT MORRIS. Partially-Printed Document Signed. Promissory Note. Philadelphia, Pa., May 12, 1795. 1 p., 4 x 6¾ in. Endorsed on verso by Morris. Ink burn through the “R” and “b” in “Robt.” Left edge irregularly cut. Endorsed on verso in separate hand: “Exhibited to us under the Commission Against Robert Morris Philad. 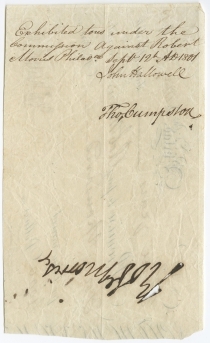 Sept 12th AD 1801.” Signed by John Hallowell and Thomas Cumpston, the commissioners appointed to oversee bankruptcy proceedings after Morris had languished in debtor’s prison for three years. The “financier of the Revolution,” Robert Morris, along with John Nicholson and James Greenleaf, formed the North American Land Company in February 1795. Its suspect land speculation deals sent him spiraling into debt. 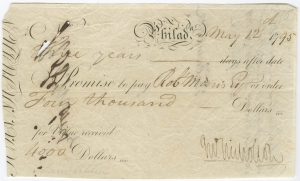 He was eventually arrested and sent to a Philadelphia debtor’s prison three years after signing this promissory note. Robert Morris (1734-1806), was one of only two men to sign the three most important documents in American history: the Declaration of Independence, the Articles of Confederation, and the Constitution. The Philadelphia merchant and land speculator was best known for his role as financier for the Continental Congress. With the national government virtually bankrupt, Morris risked his own personal fortune by purchasing supplies for the army, pressuring the states for cash contributions and securing a major French loan to finance the Bank of North America. He spent his remaining years in various public positions, including senator of Pennsylvania. Morris speculated extensively in Western land after the war, forming the North American Land Co. with James Greenleaf and Jonathan Nicholson. Soon after, however, the land market collapsed and Morris was ruined. 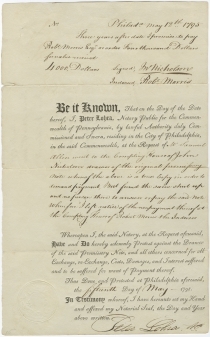 The final blow came in 1798, when a minor creditor’s claim sent him to the Philadelphia debtor’s prison. It has often been said that while George Washington was president, he felt he could not pardon his long-time friend, but visited Morris in debtor’s prison as a show of support. That story is only half true. Morris didn’t enter debtor’s prison until 1798, two years after Washington’s presidency, so Washington couldn’t have pardoned him, but he did visit Morris in prison, where the latter remained for three years until his wife was able to bail him out. John Nicholson (1758-1800) was a Welsh-born émigré to Pennsylvania who engaged in a variety of business ventures in revolutionary-era Philadelphia. In 1778 he was appointed clerk to the Board of Treasury of the Continental Congress. In 1782 he was appointed state Comptroller General, involving him in the collection of taxes and the liquidation of Loyalists convicted of treason in absentia. In 1793, he was impeached for personally speculating in federal securities with state funds. He was acquitted but forced to resign because he was by this time a large public defaulter. In 1795, he joined Robert Morris and James Greenleaf in creating the North American Land Company, which invested in six million acres of lands in six states. Stung by the worldwide panic of 1797 and the Napoleonic Wars (which drove down the European market for American lands), Morris and Nicholson were each imprisoned for debt. Nicholson died in 1800, more than four million dollars in debt. His estate was not satisfactorily settled for over a half-century, and required the creation of a special Nicholson Court of Pleas in 1843.